Please join us for our annual Call and Response Foundation Spring Retreat with Shantala, Scott Hari Whitmore, and Mu Evan Bushnell. 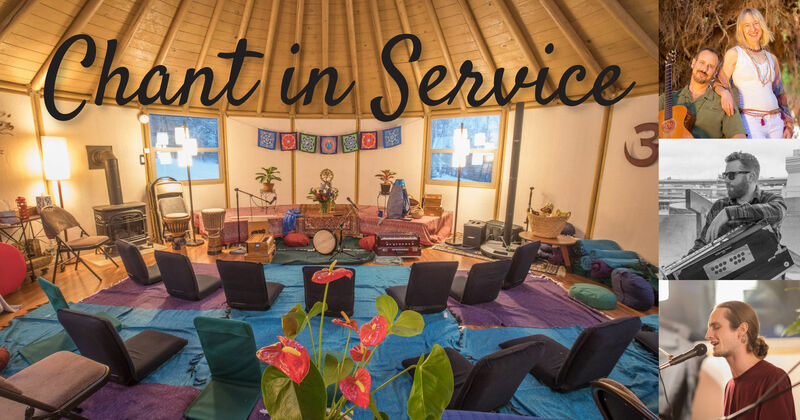 This unique retreat will follow our Chant in Service model, combining kirtan practice with seva projects within the local community. This year our service element will include cooking and serving Saturday night dinner for the Bridge House Homeless Shelter. Mornings will include yoga offerings from Jennifer Bandilli Williams and meditation and chanting from our various leaders. Each evening will include beautiful kirtan! Friday night will feature the incredible duo from Portland Oregon: Shantala Music. Benjy and Heather Wertheimer have been leading kirtan worldwide since 2001. They are known for their special gift of bringing the audience into a vast and loving experience. Together they create music with beauty, passion, and reverence. Saturday evening will feature Scott Hari Whitmore and Mu Evan Bushnell, who together served as personal assistant and caregivers for Ram Dass. Scott and Mu began leading kirtan together over six years ago and have recently formed a kirtan band, Kripa, along with their dear bhakti brothers, Sitaram and Carl Golembeski. This June, Kripa will be touring the west coast leading chanting at prisons and yoga studios from Portland Oregon to Los Angeles. Shared accommodations in beautiful farm house and cabin are included and includes lovingly prepared homemade vegetarian meals. If you prefer, you can also arrange for your own housing or attend for the day. Call and Response Foundation has partnered with Give Lively to securely process your online donation. This transaction will appear on your credit card statement as "Call and Response Foundation". This transaction is subject to Give Lively's Terms and Privacy.